A 27-year-old was hit and killed by a passing vehicle when he left his own car following a weekend collision. According to My FOX Boston, witnesses say that the man was involved in a single-car accident on Route 3 at roughly 10:00 p.m. After the accident, he started walking down the road and was hit by several passing vehicles. He was pronounced dead as emergency responders arrived on scene. Our Boston car accident lawyers understand that the scene of an accident can be a confusing, frustrating and intimidating place. There are a number of steps that you should take to not only ensure that you’ve got proper reports of the accident, but also so you can stay safe and avoid another accident. First of all, you want to make sure that everyone involved is okay. If there are any injuries, dial 9-1-1 for emergency help right away and file an accident report. This is not the time to panic. Just take it step by step and make sure everything gets done thoroughly. Secondly, you should get information from the other parties involved. Get their name, their address, their license plate numbers, their phone numbers, insurance provider information, the make/model/year/color of their vehicle as well as a write out/picture of the accident scene. If the name on an auto registration is different than the driver, jot down the relationship. If you can, try to snap some picture of the accident scene. Most phones have cameras on them — use it. 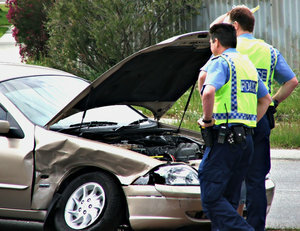 When dealing with the aftermath of an accident, you want to keep thorough records. Keep your own timeline about the accident and its effect on your life. Make sure that you list all of your doctor’s visits, days that you weren’t able to go to work and events that you couldn’t attend because of your injuries. Remember that you don’t want to talk with the other driver’s insurance company. Don’t give your own insurance company any details about the accident, except when and where it occurred, until you talk with an attorney. Make sure you always have a first-aid kit in your vehicle, to treat any minor injuries. According to Cars.com, move your vehicles if you can. Safely move out of the way of traffic, but if you can’t move your car without causing further damage, don’t try. Your insurance company should be able to hire a tow truck to move it for you. If you can’t get out of your car — or it’s not safe to try — keep your seatbelt fastened, turn on your hazard lights, then call 911 if possible and wait for help to arrive. You never want to leave the scene of an accident. Being prepared is your best way to avoid any further accidents. Make sure you’re thinking with a clear mind and staying out of the way of any more accidents. If you or a loved one was hurt in a traffic accident in Massachusetts, call the Law Offices of Jeffrey S. Glassman for a free and confidential appointment — 1-888-367-2900.